Student Contributors : Shovik Das and Ganesh J. This article highlights the issues in the approval processes and implementation of SEZs in India. These issues could either be in the conceptualization, implementation or in the governance of the SEZ policies. 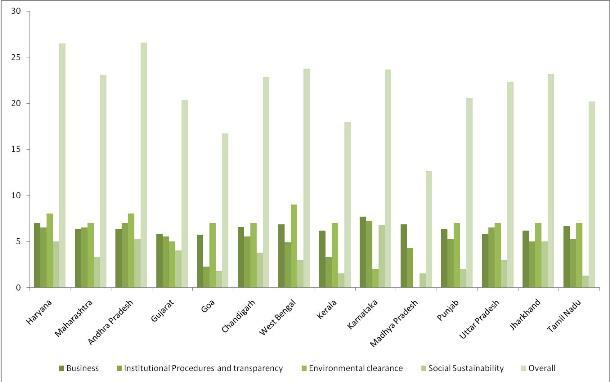 Through a new state-wise index, it tries to explore the key criteria for the success of an SEZ. It also tries to answer some broad questions concerning SEZs such as the optimum size, location and the role to be played by the state and the centre. Some observations, insights and recommendations follow from the index-based analysis and interviews with experts. The enforcement of the Indian Special Economic Zone (SEZ) Act in 2005 has seen a large number developers applying for SEZ Approvals. Touted as engines of economic growth, SEZs have created quite a stir in the country in the past 4 years, raising several issues including adequacy of the provisions of the Act. The application goes through an in-principle approval which is followed by acquisition of land that leads to the final notification. We have seen that it may take close to 3 years from the application stage to final notification of an SEZ. iOther issues include the size of the SEZ (huge chunks or smaller pieces of land), location (coastal or landlocked) and the relative role of the State against the Centre. Land acquisition has become the biggest obstacle to the successful implementation of the SEZ policy, accentuated by the scars of Nandigram and Singur. In this context, is our SEZ policy robust? If not, where does the gap lie? Is it in the conceptualization, implementation or governance? Different states have different SEZ stories to tell. While some have done exceedingly well, others seem to be going nowhere. Does the history of industrial development in the state determine, to any extent, the success of SEZs in that state?ii With each state coming up with its own SEZ policy iii, we have ventured to rank these states on an index based continuum that is constructed based on certain key parameters that could be used to evaluate the performance of SEZs. The ranking that results has later been compared with other traditional parameters such as the Gross State Domestic Product(GSDP) growth rates in the state and the level of investment in industrial infrastructure. The political economy of the state may also have a miniscule yet prominent role to play in the success of SEZs. States are evaluated on each of the sub-parameters on a scale of 10. The cumulative score on each parameter is calculated as a weighted average of the sub-parameter scores. Only for the parameter of Business Incentives, a varying weight is provided to the sub-parameters. The weights given are Fiscal Benefit (2), Provision of infrastructure facilities (2), Electricity distribution license & duty exemption (1) and Freedom to charge tariff for services (1). These weights have been whetted with some SEZ expert researchers in India. For all other parameters, a simple average of the sub-parameters is taken. So each of the 4 parameters have a score out of 10.The 4 parameter scores are added to get the overall index score of the State SEZ Policy. For some states, it may be relevant to add special sub-parameters under one of the main parameters to present a holistic view of that state's SEZ policy. For example, the states of Goa, Chandigarh and Jharkhand give special importance to IT/ ITeS. For these states, SSI and/or IT registration tax exemption criteria is mentioned in the policy. Similarly for West Bengal, there is a Fund of SEZ Authority and separate directives for maintenance of accounts. For all these special cases, these are added as sub-parameters and given half the weight while calculating the parameter index, on a state-by-state basis. The states' scores are in Exhibit 1. 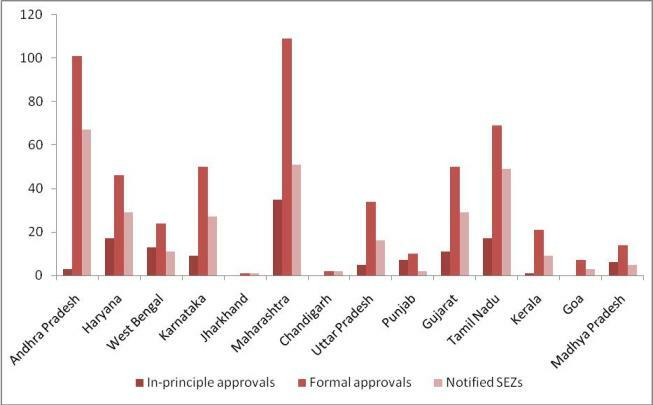 Exhibit 2 illustrates the state wise distribution of the number of In-principle approvals, Formal approvals and Notified SEZs as on 13.05.09 and clearly illustrates the disparity in the same. Next, we tried to see if the difference in the number of notified SEZs in the states can be explained by our Policy Index Ranking. 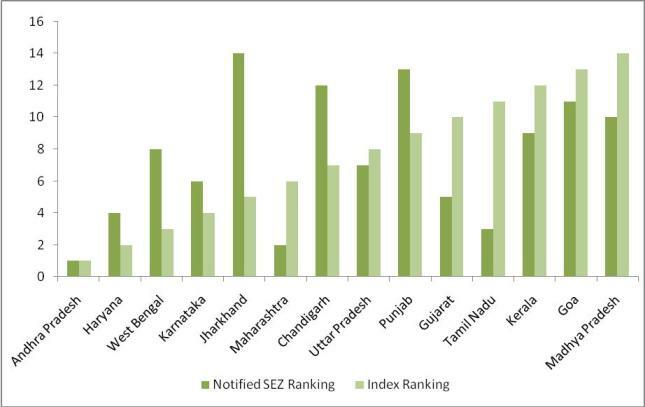 This can be seen in Exhibit 3 that plots both the SEZ and the index rankings of the 14 states. The above analysis shows that the comprehensiveness and the effectiveness of the State SEZ Policy can explain the growth of SEZs in the states to some extent. But it also lends credence to the argument that there could be other factors which drive the growth of SEZs in the states. The business environment and the level of industrialization in the state may be some of these factors. For measuring the level of industrialization of the States, we use the State GSDP absolute figures and State GSDP growth figures as proxies. We rank the states based on the state GSDP figures of 2005-06. 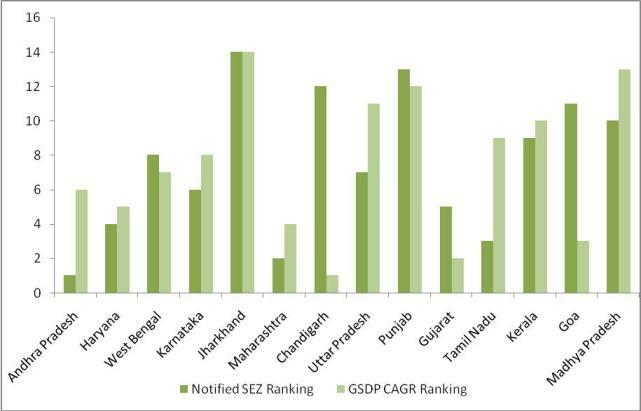 We compare the GSDP ranking with the Notified SEZ rankings for 14 states. From the above comparison, it is quite clear that State GSDP can explain the disparity in the SEZ approvals. Hence, the level of industrialization of the state (measured by GSDP) does determine the number of SEZs being approved in the state. The above ranking of GSDP growth rate also explains the growth of Notified SEZs to some extent. So we find that both State GSDP and GSDP growth rates provide significant explanation to the SEZ growth in the states. Thus the level of industrialization (explained by State GSDP and GSDP growth) of the states explain the growth of Notified SEZs in the state. We have used the State-wise Funds released under Industrial Infrastructure Up gradation Scheme (IIUS) in India as a proxy of state industrial infrastructure investment to explain the growth of the Notified SEZs in the states. This serves as a proxy for the level of Industrial Infrastructure of the states. 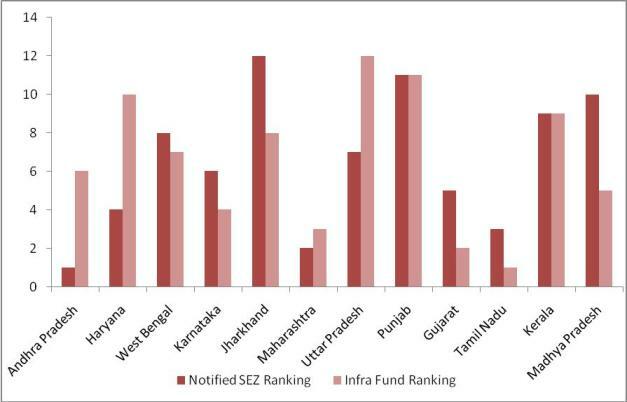 A comparitive graph showing the notified SEZ ranking and Industrial Infrastructure working is shown in Exhibit 5. We find that investment in industrial infrastructure is a driver of the SEZ growth in a state. From the above analysis we can conclude that the strength (comprehensiveness and effectiveness) of the SEZ policy is an important determinant of the SEZ notifications in the state. The SEZ growth in the state is also driven by the level of industrialization (measured by state GSDP and its growth rate) and the level of investment in industrial infrastructure. Fiscal incentives such as stamp duty exemption have not been uniformly implemented in all states which lead us to the contentionv that even if provided, these are just ephemeral incentives. With respect to land, there is no earmarking of sites for SEZs by the Govt or provision of initial infrastructurevi. The long gestation period (single window clearance is almost a farce) till notification further makes the land unusable. Moreover, there is no clear exit mechanism for the SEZ developers in the policy.vii Some experts have also expressed concern that there is probably too much emphasis on products from SEZs being used for exports only, in our policy . At the application stage, some experts question the necessity for a two-stage process itself. Why should we have in-principle approvals at all? Our interviews with a few officials involved in the implementation of the SEZ policy were quite insightful in validating some of the hypotheses we had made. For the question of whether we have too few or too many SEZs in India right now, the clear answer is "too many".viii However, with a better understanding of the risks involved and with the increasing impact of the global recession, there is a slow and steady decline in the applications that the Board of Approval has been receiving in the recent past. However, this is only an external ramification.ix To permanently restrict the applications, the Govt should play a larger role by earmarking specific sites for SEZs and inviting applications only for these sites. This would also reduce the number of rejections in the later stages. On a similar note, the widely held opinion is that, we need to increase the size of our SEZs in order to support multi-product zones. For this, contiguous land is a pre-requisite and this is where the problems of land acquisition start. While coastal SEZs seem to be doing better than landlocked ones, experts say that with strong support from the States and the Centre, even the connectivity issues with hinterland SEZs may be resolved.